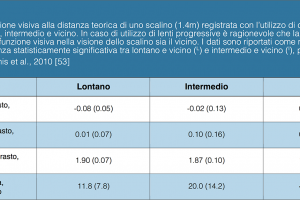 The authors, in order to obtain a simple and precise tool for the evaluation of visual acuity, have studied and realized the Milan Eye Charts (Mec). It consists in a series of tables whose structure, graphic design and administration procedure follow precise criteria and a well-defined scientific approach. The four optotype tables are realized using letters, reproduced with different crowding (inter-optotype spacing) ranging among the 100% – 50% – 25% – 12.5% on A4 sheets, designed to be placed at a distance of three meters from the subject under examination.252 children have been selected as participants, , they were asked to read aloud the letters from top to bottom until they made an error. At this point the examiner indicated the previous line and the participant was required to read aloud the whole line. Once the size of the letters approached the threshold, the child was encouraged to guess until the number of errors was higher than the number of correct letters read. Using this method for each of the four levels of crowding, three visual acuity scores were obtained. These values were averaged in order to obtain four final scores only, one for each level of crowding. The different trajectories of visual acuity measured with high spaced and low spaced eye-charts suggest that the mechanisms that helps in reducing the crowding effects develops later in the life than the VA does, and it is, in part at least, dissociated by the psychophysiological development of lower level visual mechanisms. The results of the research showed the applicability of the Milan Eye Chart starting from the first class of at primary school, and have highlighted that the processes responsible for the crowding phenomenon develop more slowly in children, completing later on if compared to those related to the ordinary development of visual acuity.